My latest in the Boston Herald is a whole bunch of old fart rambling about people who don't exist any longer. It's not that they died or anything; they don't exist in a professional sense, generally speaking. Or they exist, but not in the same way. Basically, it's unrepentant melancholia. Oh, boy! Thanks, as always, for reading my stuff. If you leave a comment at the Herald website, here's another thank you. If the comment you leave is uncomplimentary, I take it back. We also had the Charles Chips man. Potato chps, popcorn, and at Christmas, cookies, right to the door! Now i want a Charles Chips tin. We had the ice man--the laundry cleaners man--the Watkins man(spices and flavorings) Great old memories. Linda in Tn. We had a Milk Man when I was a kid. Also a Bread Man, and a Fuller Brush Man. 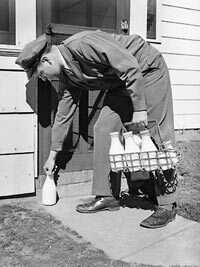 There haven't been Milk Men in this neighborhood for decades, but a lot of the houses still have the little pass-thru doors (or the insulated boxes on the porch) where the Milk Man would leave your order, and you'd leave your empties. . .